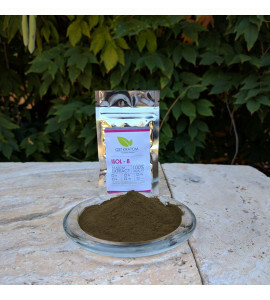 The isol-8 is our new standardized extract, guaranteed to be at least 8% mitragynine but with a full spectrum of other naturally extracted kratom alkaloids. We thought that this had a chance to quickly become a new customer favorite, based on its affordability and efficacy. If you like kratom extracts, we think this is a good one to consider. ISOL-8 There are 5 products. The isol-8 is our new standardized extract, guaranteed to be at least 8% mitragynine but with a full spectrum of other naturally extracted kratom alkaloids. Contains 2 grams. The isol-8 is our new standardized extract, guaranteed to be at least 8% mitragynine but with a full spectrum of other naturally extracted kratom alkaloids. Contains 8 grams. The isol-8 is our new standardized extract, guaranteed to be at least 8% mitragynine but with a full spectrum of other naturally extracted kratom alkaloids. Contains 16 grams. The isol-8 is our new standardized extract, guaranteed to be at least 8% mitragynine but with a full spectrum of other naturally extracted kratom alkaloids. Contains 30 grams.